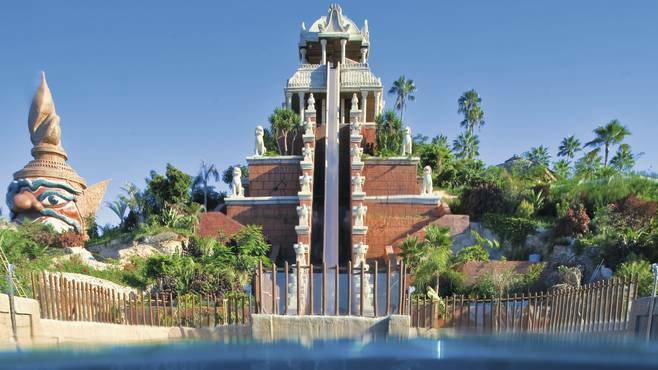 Siam Park Waterpark Tenerife is considered to be one of the worlds best waterparks. First Choice have teamed up with Siam Park to offer holidays to selected resorts under the banner of SplashWorld. Guests staying at these selected resort hotels including HD Parque Cristobal Tenerife get free access (Included in cost of All Inclusive Holiday) to Siam Park Waterpark. Siam Park is off-site from these family resorts. However a free shuttle bus or taxi will take you to and from the waterpark. Siam Park brings a touch of Thailand with added thrills and spills. Big-hitters like the Tower of Power and The Dragon keep the screams coming, while the Mai Tai River and the huge wave pool are great for all the family. Kids get the Lost City – a fortress teeming with bridges, waterfalls, tipping buckets and 9 slides suited to youngsters. Relax on the Mai Thai River, Siam Beach Cabanas, Floating Market or Sea Lion Island. Looking for Family Fun? Try out Naga Racer, Sawasdee, Jungle Snake, and The Lost City. Some of the slides are too big for little ones. Siam Park tower of power height restrictions – Minimum height 1.42m. Siam Park Lazy River height restrictions – Minimum height 1.10m. Three attractions have a minimum height of 110cm, five attractions have a minimum height of 125cm and one has a minimum height of 140cm and minimum age of 14 years. Inclusive tickets are available when booking a holiday at selected Tenerife hotels or you can book tickets only. Check out Siam Park’s Website for more information.